With the release of our ‘Decade In Breakbeat’ compilation imminent, we’ve been thinking of ways to celebrate our 10 years in this music game, and, what better way to celebrate than hand over to the people that have kept us alive over those 10 years – the supporters. We’re inviting you to put together an hour long mix of Subtle Audio tunes released on vinyl, CD or as a digital download over the last 10 years or so. 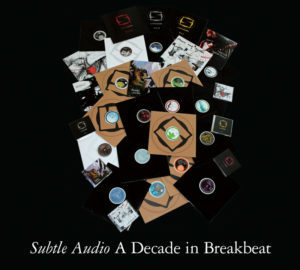 We’ll give the winner a free copy of the new ‘Decade In Breakbeat’ compilation release on vinyl and CD. AND – the winners mix will also be posted on the Subtle Audio site. We will also be posting 2 others mixes we like, so why not have a go ! ^ Don’t forget to replace the ‘AT’ with @ and the ‘dot’ with one of these . Just one of these . Next Next post: Dissident – “Overself Archipelago”, the video !